The quantitative compositions of the major constitutive diterpenoids in the rhytidome and secondary phloem of the branch bark of Kuril larch (Larix gmelinii var. japonica) were investigated. The eight major diterpenoids were isolated from a diethyl ether extract of the branch bark of L. gmelinii var. japonica and identified as 13-epimanool (1), larixol (2), larixyl acetate (3), 13-epitorulosyl acetate (4), abietic acid (5), neoabietic acid (6), dehydroabietic acid (7), and isopimaric acid (8). The amount of each diterpenoid was subsequently quantified in both the rhytidome and secondary phloem. All of the diterpenoids were present in both bark tissues, but the amounts were significantly higher in the rhytidome than in the secondary phloem. Developed fusiform resin cavities containing oleoresins were commonly observed in dead secondary phloem captured into the rhytidome of a bark transverse section. The accumulation and distribution of these constitutive diterpenoids in the bark tissues can probably be attributed to terpenoid biosynthesis in the living secondary phloem and the rhytidome formation process. From the viewpoint of constitutive chemical defense in conifers, it is suggested that the tree body may be more effectively defended against natural enemies by the higher amount of diterpenoid amount in the outermost and dead bark tissue, the rhytidome, where the potentially poisonous and easily oxidizable diterpenoids can be safely and stably maintained. 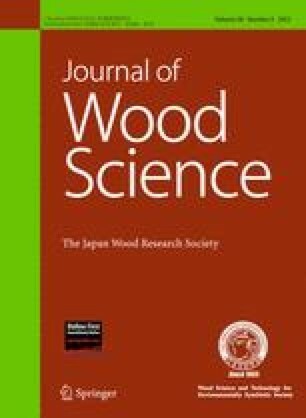 Part of this report was presented at the 54th Annual Meeting of the Japan Wood Research Society, Sapporo, Japan, August 2004 and the 25th Annual Meeting of the International Society of Chemical Ecology, Neuchâtel, Switzerland, August 2009. The primary function of tree bark is to physically and chemically protect the tree body from weather and natural enemies [1, 2]. Constitutive defense by conifer bark against a great number of enemies, such as phytopathogens, herbivorous insects, and mammals, results from a combination of toxic chemicals, anatomical structures, and the location of the chemicals [3, 4, 5]. Healthy conifers constitutively produce and store oleoresins, whose major components are terpenoids that protect the trees by preventing outbreaks of pests [6, 7, 8, 9]. Hence, constitutive terpenoids in conifer bark provide a very important front-line defense against enemies [5, 10]. Kuril larch (Larix gmelinii var. japonica) was introduced to Hokkaido Island, northern Japan, from Sakhalin and the southern Kuril Islands. L. gmelinii var. japonica is one of the important parent tree species for forest tree breeding on Hokkaido Island because it is superior to other introduced Larix species, such as Japanese larch (L. kaempferi), in its trait of resistance to bark consumption under snow by the native gray red-backed vole (Myodes rufocanus bedfordiae: formerly Clethrionomys rufocanus bedfordiae) [11, 12, 13]. The resistance of L. gmelinii var. japonica to the vole is considered to be a chemical-based defense that results from constituents in its bark. Previous studies have shown that the resistance can be attributed to resin cyst number/size, essential oil and/or crude fat contents in the bark [14, 15], and essential oil and/or crude resin (determined from diethyl ether extracts) contents in the bark [11, 16]. The degree of resistance to voles among the larches significantly correlated with the contents of the diethyl ether extracts of the bark . Some diterpenoids in the petroleum ether extract from the branch bark of L. gmelinii var. japonica could be associated with the resistance to the vole . Our previous report  also showed that the chemical composition of the branch bark tissue of L. gmelinii var. japonica was an effective index for discrimination of hybrid larch F1 (L. gmelinii var. japonica × L. kaempferi) seedlings with superior growth rate and chemical defense, e.g., resistance to voles. Mature bark basically consists of two types of bark tissues, rhytidome and secondary phloem, which are also referred to as the outer and inner bark, respectively . The secondary phloem is living tissue, which is differentiated from the vascular cambium . It biosynthesizes a large number of primary and secondary metabolites from assimilation products of photosynthesis and also transports and stores these metabolites . In contrast, the rhytidome is dead tissue, which originally develops from the secondary phloem . It physically protects the tree body . Conifers, especially Pinaceae trees, biosynthesize and store many constitutive terpenoids in the living secondary phloem [10, 23]. However, little is known about the quantitative composition and distribution of terpenoids in the rhytidome of conifers. Understanding the details of bark chemical defense is important for forest tree breeding, and the role of the chemical defense of the rhytidome remains unclear. We investigated the accumulation of the major constitutive diterpenoids in the rhytidome of the branch bark of L. gmelinii var. japonica and compared the contents with those in the secondary phloem to understand how defensive compound placement and anatomical structures in the conifer bark are integrated into constitutive defense. For this purpose, we isolated, purified, and identified diterpenoids from a diethyl ether extract of the branch bark of L. gmelinii var. japonica. Next, the diterpenoids were used as authentic compounds for their subsequent quantification in both bark tissues. In this report, we also discussed diterpenoid accumulation and anatomical formation of bark tissues for constitutive chemical defense in L. gmelinii var. japonica. Samples for diterpenoid analysis were collected from a 30-year-old L. gmelinii var. japonica tree at the Doto station of the Forestry Research Institute, Hokkaido Research Organization, Shintoku town (200 m a.s.l., 43°04′N, 142°50′E), central Hokkaido Island. In September 2000, the branches were collected from the north side of 12 tree stems at an approximate height of 8 m using a handsaw with a long handle. All branch samples had developed rhytidome, and their age and end diameters were within 10–15 years and 3–5 cm, respectively. They were immediately cooled and placed in a laboratory freezer at −20 °C until chemical analyses were performed. 1H and 13C nuclear magnetic resonance (NMR) spectra were obtained using a JNM-AL400 spectrometer (JEOL, Tokyo, Japan) with standard pulse sequences operating at 400 and 100 MHz, respectively. CDCl3 (Sigma-Aldrich, St. Louis, MO, USA) was used as a solvent, and tetramethylsilane (TMS; Wako Pure Chemical Industries, Osaka, Japan) was used as an internal standard. Electron and chemical impact mass spectrometry (EIMS and CIMS) spectra were recorded on a JMS-600H spectrometer (JEOL), and the former was performed at an ionizing energy of 70 eV, while the latter was performed with ammonia or isobutane as the reagent gas at 250 eV. Infrared (IR) spectra were determined using a FT/IR-8900 spectrometer (Jasco, Tokyo, Japan). Silica gel column chromatography (SiGCC) was performed on silica gel 60 (0.063–0.200 mm, Merck, Darmstadt, Germany) packed in a glass column (700 mm × 60 mm i.d.). Preparative high-performance liquid chromatography (HPLC) with gradient elution was performed using two LC-10A pumps, an SPD-10A ultraviolet (UV) detector (wavelength: 245 nm), and an FRC-10A fraction collector (all these equipment were from Shimadzu, Kyoto, Japan), and a Mightysil RP-18GP octadecylsilane (ODS) column (column size, 250 mm × 20 mm i.d. ; particle size of the column substrate, 5 μm; Kanto Chemical, Tokyo, Japan). Gas chromatography (GC) was performed using a GC-14A gas liquid chromatograph equipped with a hydrogen flame ionization detector (FID) (Shimadzu), and a DB-1 fused silica capillary column (30 m × 0.32 mm i.d., 0.25 μm film thickness; Agilent Technologies, Santa Clara, CA, USA). The column was heated from 170 to 280 °C at 5 °C/min. The injection and detection port temperatures were maintained at 280 and 290 °C, respectively, and helium was used as the carrier gas. Optical microscopy and digital imaging were performed using a SMZ-U stereoscopic zoom microscope equipped with an E4500 digital camera (both from Nikon, Tokyo, Japan). The schema for separating the diterpenoids from the branch bark of L. gmelinii var. japonica is shown in Fig. 1. For the branches sampled from the individual trees, the bark near the stem side was peeled off using a steel scraper, crushed in a homogenizer with liquid nitrogen, and then lyophilized for 24 h. The freeze-dried bark meal (300 g) was extracted with diethyl ether (3 l × 2) for 2 days at room temperature. Evaporation of the extract in vacuo under a stream of nitrogen yielded a dark yellow viscid residue (15.7 g). The extract was separated into neutral (6.6 g) and acidic (3.2 g) fractions according to solubility in 1 % NaOH aqueous solution, and these two fractions were each further separated by SiGCC and preparative HPLC using the ODS column (Fig. 1). The neutral fraction was separated into three fractions, designated N2 (723 mg), N4 (803 mg), and N6 (1234 mg), by preliminary SiGCC (silica gel, 900 g) and eluted with benzene (C6H6)–ethyl acetate (EtOAc) (8:2 v/v). Fraction N22 was purified from fraction N2 by preparative HPLC [eluent, acetonitrile (MeCN)–H2O (7:3 v/v); flow rate, 9.5 ml/min]. Fraction N4 was separated into fractions N42 and N44 using the previously described HPLC procedure. The acidic fraction was neutralized with dilute aqueous hydrochloric acid solution, preliminarily chromatographed on silica gel, and then eluted with C6H6–EtOAc (8:2 v/v) containing 0.1 % formic acid to obtain fraction A2 (1362 mg). The resulting fraction A2 was further separated into fractions A22, A24, A26, and A28 by preparative HPLC with gradient elution [eluent, MeCN–H2O (7:3–85:15 v/v); flow rate, 9.5 ml/min]. Compound 1 (261 mg) was obtained as an amorphous substance from fraction N22. 1H NMR (400 MHz, CDCl3): δ 0.68 (s, 3H, 20-Me), 0.80 (s, 3H, 19-Me), 0.87 (s, 3H, 18-Me), 1.27 (s, 3H, 16-Me), 4.51 (s, 1H, 17-H), 4.82 (s, 1H, 17-H), 5.05 (dd, 1H, J = 1.2 and 10.8 Hz, 15-H), 5.20 (dd, 1H, J = 1.2 and 17.6 Hz, 15-H), 5.91 (dd, 1H, J = 10.8 and 17.2 Hz, 14-H). 13C NMR (100 MHz, CDCl3): δ 14.4 (20-Me), 17.7 (11-CH2), 19.4 (2-CH2), 21.7 (19-Me), 24.4 (6-CH2), 27.6 (16-Me), 33.5 (4-C), 36.1 (18-Me), 38.3 (7-CH2), 39.0 (1-CH2), 39.8 (10-C), 41.3 (12-CH2), 42.1 (3-CH2), 55.5 (5-CH), 57.2 (9-CH), 73.4 (13-C–O), 106.2 (17-CH2), 111.2 (15-CH2), 144.9 (14-CH), 148.3 (8-C). EIMS (70 eV): m/z (%) 272 (M+−H2O, 69), 257 (91), 137 (100). CIMS (250 eV, ammonia): m/z (%) 308 (M++NH4, 100), 290 (M+, 79), 273 (96). IR ν max (CHCl3) cm−1: 3418, 3081, 2931, 1645, 1459, 918, 889. Compound 2 (691 mg) was obtained as colorless microcrystals from fraction N6 by recrystallization with benzene. 1H NMR (400 MHz, CDCl3): δ 0.69 (s, 3H, 20-Me), 1.01 (s, 3H, 19-Me), 1.12 (s, 3H, 18-Me), 1.27 (s, 3H, 16-Me), 4.60 (s, 1H, 17-H), 4.89 (s, 1H, 17-H), 5.06 (dd, 1H, J = 1.2 and 10.8 Hz, 15-H), 5.20 (dd, 1H, J = 1.2 and 17.6 Hz, 15-H), 5.91 (dd, 1H, J = 10.6 and 17.4 Hz, 14-H). 13C NMR (100 MHz, CDCl3): δ 16.0 (20-Me), 18.0 (11-CH2), 18.4 (2-CH2), 22.3 (19-Me), 27.7 (16-Me), 33.5 (4-C), 36.1 (18-Me), 38.3 (7-CH2), 39.0 (1-CH2), 41.3 (10-C), 43.7 (12-CH2), 49.1 (3-CH2), 56.4 (5-CH), 60.4 (9-CH), 71.5 (6-C–O), 73.3 (13-C–O), 108.2 (17-CH2), 111.3 (15-CH2), 144.8 (14-CH), 145.2 (8-C). EIMS (70 eV): m/z (%) 288 (M+−H2O, 35), 273 (27), 153 (46), 109 (83), 69 (100); CIMS (250 eV, ammonia): m/z (%) 324 (M++NH4, 100), 306 (M+, 12), 296 (13); IR ν max (KBr) cm−1: 3450–3350, 3085, 2929, 1648, 922, 877. Compound 3 (183 mg) was obtained as an amorphous substance from fraction N44. 1H NMR (400 MHz, CDCl3): δ 0.74 (s, 3H, 20-Me), 0.87 (s, 3H, 19-Me), 1.01 (s, 3H, 18-Me), 1.26 (s, 3H, 16-Me), 2.05 (s, 3H, OAc), 2.68 (dd, 1H, J = 5.2 and 12.4 Hz, 7-H), 4.64 (s, 1H, 17-H), 4.93 (s, 1H, 17-H), 5.06 (dd, 1H, J = 1.2 and 10.8 Hz, 15-H), 5.20 (dd, 1H, J = 1.2 and 17.2 Hz, 15-H), 5.91 (dd, 1H, J = 10.8 and 17.2 Hz, 14-H). 13C NMR (100 MHz, CDCl3): δ 15.9 (20-Me), 18.0 (11-CH2), 18.4 (2-CH2), 21.9 (22-Me), 22.4 (19-Me), 27.7 (16-Me), 33.4 (4-C), 36.1 (18-Me), 39.0 (7-CH2), 39.8 (1-CH2), 41.2 (10-C), 43.4 (12-CH2), 44.1 (3-CH2), 56.2 (5-CH), 57.4 (9-CH), 73.1 (6-C–O), 73.3 (13-C–O), 109.2 (17-CH2), 111.4 (15-CH2), 143.9 (14-CH), 144.8 (8-C), 169.7 (21-COMe). EIMS (70 eV): m/z (%) 288 (M+−AcOH, 24), 270 (75), 255 (100). CIMS (250 eV, ammonia): m/z (%) 366 (M++NH4, 100), 348 (M+, 15); IR ν max (CHCl3) cm−1: 3461, 3086, 2927, 1737, 1445, 1378, 1243, 1024, 919. Compound 4 (163 mg) was obtained as an amorphous substance from fraction N42. 1H NMR (400 MHz, CDCl3): δ 0.68 (s, 3H, 20-Me), 1.05 (s, 3H, 18-Me), 1.27 (s, 3H, 16-Me), 2.03 (s, 3H, OAc), 3.85 (d, 1H, J = 11.2 Hz, 19-H), 4.22 (d, 1H, J = 11.2 Hz, 19-H), 4.55 (s, 1H, 17-H), 4.82 (s, 1H, 17-H), 5.05 (dd, 1H, J = 1.2 and 10.8 Hz, 15-H), 5.20 (dd, 1H, J = 1.4 and 17.4 Hz, 15-H), 5.91 (dd, 1H, J = 10.8 and 17.2 Hz, 14-H). 13C NMR (100 MHz, CDCl3): δ 15.2 (20-Me), 17.8 (11-CH2), 18.9 (2-CH2), 20.9 (22-Me), 24.4 (6-CH), 27.5 (18-Me), 27.6 (16-Me), 36.2 (3-CH2), 37.2 (4-C), 38.4 (7-CH2), 38.8 (1-CH2), 39.6 (10-C), 41.2 (12-CH2), 56.0 (5-CH), 57.2 (9-CH), 66.6 (19-CH2), 73.3 (13-C–O), 106.7 (17-CH2), 111.3 (15-CH2), 144.9 (14-CH), 147.5 (8-C), 170.9 (21-COMe). EIMS (70 eV): m/z (%) 330 (M+–H2O, 35), 315 (25), 288 (15), 270 (36), 257 (78), 135 (100). CIMS (250 eV, ammonia): m/z (%) 366 (M++NH4, 100), 348 (M+, 85), 331 (43). IR ν max (CHCl3) cm−1: 3466, 3082, 2930, 1740, 1243. Compound 5 (35 mg) was obtained as colorless microcrystals from fraction A26. 1H NMR (400 MHz, CDCl3): δ 0.81 (s, 3H, 20-Me), 0.95 (s, 3H, 19-Me), 1.03 (d, 3H, J = 6.9 Hz, 16-Me), 1.24 (d, 3H, J = 6.9 Hz, 17-Me), 2.87 (sept, 1H, J = 6.9 and 6.9 Hz, 15-H), 5.37 (m, 1H, 7-H), 5.77 (d, 1H, J = 2.4 Hz, 14-H). 13C NMR (100 MHz, CDCl3): δ 14.0 (20-Me), 16.7 (19-Me), 18.0 (2-CH2), 20.8 (17-Me), 21.4 (16-Me), 22.4 (11-CH2), 25.6 (6-CH2), 27.4 (12-CH2), 34.4 (10-C), 34.8 (15-CH), 37.1 (3-CH2), 38.2 (1-CH2), 44.9 (5-CH), 46.2 (4-C), 50.8 (9-CH), 120.2 (7-CH), 122.1 (14-CH), 135.2 (8-C), 144.9 (13-C), 184.2 (18-COOH). EIMS (70 eV): m/z (%) 302 (M+, 100), 287 (49), 259 (76), 270 (36), 239 (47), 136 (68). CIMS (250 eV, isobutane): m/z (%) 303 (M++H, 100), 257 (20). IR ν max (KBr) cm−1: 3413, 2935, 1460, 1386, 1278. Compound 6 (23 mg) was obtained as colorless microcrystals from fraction A24. 1H NMR (400 MHz, CDCl3): δ 0.79 (s, 3H, 20-Me), 1.20 (s, 3H, 19-Me), 1.70 (d, 3H, J = 6.9 Hz, 16-Me), 1.73 (d, 3H, J = 6.9 Hz, 17-Me), 6.20 (d, 1H, J = 2.4 Hz, 14-H). 13C NMR (100 MHz, CDCl3): δ 15.3 (20-Me), 16.8 (19-Me), 18.1 (2-CH2), 19.7 (17-Me), 20.4 (16-Me), 22.3 (11-CH2), 24.9 (6-CH2), 25.8 (12-CH2), 35.5 (7-CH2), 37.1 (3-CH2), 37.7 (10-C), 38.5 (1-CH2), 47.3 (4-C), 48.6 (5-CH), 51.5 (9-CH), 122.2 (14-CH), 123.6 (15-C), 128.2 (13-C), 138.4 (8-C), 185.1 (18-COOH). EIMS (70 eV): m/z (%) 302 (M+, 48), 148(24), 135(100). CIMS (250 eV, isobutane): m/z (%) 303 (M++H, 100), 257 (36). IR ν max (KBr) cm−1: 3413, 2935, 1694, 1456, 1281, 821. Compound 7 (81 mg) was obtained as colorless microcrystals from fraction A22. 1H NMR (400 MHz, CDCl3): δ 1.21 (s, 3H, 20-Me), 1.26 (s, 3H, 19-Me), 1.23 (d, 3H, J = 6.9 Hz, 16-Me), 1.23 (d, 3H, J = 6.9 Hz, 17-Me), 2.24 (dd, 1H, J = 12.4 and 2.4 Hz, 5-H), 2.88 (sept, 1H, J = 6.9 and 6.9 Hz, 15-H), 6.88 (brs, 1H, 14-H), 7.16 (d, 1H, J = 2.4 Hz, 11-H). 13C NMR (100 MHz, CDCl3): δ 16.2 (19-Me), 18.5 (2-CH2), 23.9 (16-Me), 23.9 (17-Me), 25.1 (20-Me), 29.9 (7-CH2), 33.4 (15-CH), 36.6 (3-CH2), 36.8 (10-C), 37.8 (1-CH2), 21.7 (6-CH2), 44.5 (5-CH), 47.4 (4-C), 123.6 (12-CH), 123.8 (11-CH), 126.6 (14-CH), 134.3 (8-C), 145.4 (13-C), 146.4 (9-C), 184.0 (18-COOH). EIMS (70 eV): m/z (%) 300 (M+, 31), 285 (100), 239 (72), 270 (36), 197 (28). CIMS (250 eV, isobutane): m/z (%) 301 (M++H, 100), 255 (64). IR ν max (KBr) cm−1: 3413, 2958, 1694, 1498, 1459, 1387, 1278. Compound 8 (413 mg) was obtained as colorless microcrystals from fraction A28. 1H NMR (400 MHz, CDCl3): δ 0.86 (s, 3H, 20-Me), 0.91 (s, 3H, 19-Me), 1.26 (s, 3H, 17-Me), 4.87 (dd, 1H, J = 10.8 and 1.2 Hz, 16-H), 4.93 (dd, 1H, J = 17.6 and 1.6 Hz, 16-H), 5.80 (dd, 1H, J = 17.6 and 10.8 Hz, 15-H). 13C NMR (100 MHz, CDCl3): δ 15.3 (20-Me), 17.1 (19-Me), 17.9 (2-CH2), 20.0 (11-CH2), 21.5 (6-CH2), 25.1 (17-Me), 34.9 (12-CH2), 36.0 (3-CH2), 36.7 (10-C), 36.9 (13-C), 38.7 (1-CH2), 44.9 (5-CH), 46.0 (14-CH2), 44.9 (4-C), 51.9 (9-CH), 109.1 (16-CH2), 120.7 (7-CH), 135.3 (8-C), 149.9 (15-CH), 184.1 (18-COOH). EIMS (70 eV): m/z (%) 302 (M+, 100), 287 (66), 257 (45), 241 (73), 187 (56). CIMS (250 eV, isobutane): m/z (%) 303 (M++H, 100), 257 (32). IR ν max (KBr) cm−1: 3412, 2936, 1637, 1458, 1348, 1280, 999, 910. For each of the respective branch samples from the 12 individual trees, the bark from the nearby stem side was exactly separated at the border of the last formed periderm into the rhytidome and secondary phloem using a scalpel. Samples of the rhytidome and secondary phloem were separately homogenized in a grinder with liquid nitrogen. The chemical analysis methods used for the rhytidome and secondary phloem were modified from those described in a previous report . A 200-mg sample of the bark tissue meal was extracted with 4 ml of petroleum ether–diethyl ether (1:1 v/v) containing 200 μg/ml heptadecanoic acid (Sigma-Aldrich) as an internal standard in a screw-cap test tube during ultrasonification in a water bath for 1 h under cooling at approximately 10 °C. The sample was centrifuged, and two 1-ml supernatant samples were evaporated to dryness under a stream of nitrogen. The content of the petroleum ether–diethyl ether extract in one of the dried samples was quantified. The other dried extract was methylated with ethereal diazomethane to derive acidic diterpenoids as their methyl esters. The major diterpenoids in the methylated samples were analyzed by GC. The eight isolated, purified, and identified diterpenoids were used as standard compounds. The peaks in the chromatograms of the diterpenoids in the samples were identified by comparing their retention times with those of the standard diterpenoids, and the diterpenoid contents were quantified using calibration curves. The contents of the derived acidic diterpenoid methyl esters were recalculated on the basis of their original corresponding acidic diterpenoids. The Wilcoxon signed rank test (n = 12) was used to compare the contents of the petroleum ether–diethyl ether extract and the diterpenoids between the rhytidome and secondary phloem. All data analysis was performed with statistical software JMP 9.0.0 (SAS Institute, Cary, NC, USA). The schema for separation of the diterpenoids from the diethyl ether extract of the branch bark of L. gmelinii var. japonica is shown in Fig. 1, and the isolated compounds are indicated by boldface numbers (1–8). The eight major diterpenoids isolated from the extract were identified by NMR, MS, and IR analyses. There were four labdane (1–4)-, three abietane (5–7)-, and one pimarane (8)-type diterpenoids (Fig. 2). Compounds 1 and 2 from the neutral fraction were identified as 13-epimanool (1) [25, 26, 27, 28, 29, 30] and larixol (2) [25, 27, 28, 29, 30], respectively, by 1H NMR, MS, and IR analyses (Fig. 2). The 1H NMR spectral data of compound 3 were similar to those of larixol (2), except for signals indicating the presence of a 6α-acetoxy group in the molecule . From this information, together with the 13C NMR and MS spectral data, compound 3 was identified as larixyl acetate (3) (Fig. 2). The 1H, 13C NMR, and EIMS spectral data of compound 4 were closely similar to those of torulosyl acetate in the previous literature [31, 32], except for its 17-H signal slightly shifted downfield compared with that of torulosyl acetate because of the attachment of a 13β-hydroxy group in the molecule [25, 26]. Therefore, compound 4 was identified as 13-epitorulosyl acetate (4) (Fig. 2). The acidic compounds 5–8 were identified as abietic acid (5) [33, 34, 35], neoabietic acid (6) [34, 35], dehydroabietic acid (7) [33, 34, 35], and isopimaric acid (8) [36, 37] (Fig. 2), respectively, by comparing the NMR, MS, and IR data with those in the literature and/or databases of organic compounds. Mills  reported the presence of seven diterpenoids (1–3 and 5–8) among the oleoresins of Dahurian larch (L. gmelinii var. gmelinii), which is a typical variety of L. gmelinii that widely occurs in east Siberia, northeast Mongolia, and northeast China. In addition, Chernenko et al. showed the presence of eight diterpenoids (1–8), including compound 4, in the petroleum ether extract of the bark of L. gmelinii var. gmelinii. Thus, the major diterpenoids biosynthesized in L. gmelinii var. japonica were similar to those biosynthesized in L. gmelinii var. gmelinii. Table 1 shows the contents of the petroleum ether–diethyl ether extract (1:1 v/v) and the composition of the major constitutive diterpenoids in the rhytidome and secondary phloem in the branch bark of L. gmelinii var. japonica. The ether extract content in the rhytidome was much higher than that in the secondary phloem (P < 0.001, Table 1). All eight diterpenoids, i.e., 13-epimanool (1), larixol (2), larixyl acetate (3), 13-epitorulosyl acetate (4), abietic acid (5), neoabietic acid (6), dehydroabietic acid (7), and isopimaric acid (8), were confirmed in both types of bark tissues (rhytidome and secondary phloem). However, the amounts of these diterpenoids were significantly higher in the rhytidome than in the secondary phloem (P = 0.001 and P < 0.001, respectively, Table 1). As noted in a previous report , the raw fat (diethyl ether extract) content including oleoresins was higher in the rhytidome than in the secondary phloem in the 36- to 42-year-old stems of L. gmelinii var. japonica, L. kaempferi, L. decidua (European larch), and L. gmelinii var. olgensis (Korean larch). In Morus alba (white mulberry) of woody angiosperms, the contents of volatile oils and resins (dichloromethane extract) containing terpenoids were higher in the rhytidome than in the secondary phloem . From the viewpoint of bark chemistry and anatomy, Srivastava  pointed out that the concentrations of fatty materials, such as waxes, fats and fatty acids, volatile oils, resins, and higher alcohols, in extractive fractions from the periderm and rhytidome were higher than those from the secondary phloem. These findings were analogous to the above results that showed the maldistribution of the constitutive diterpenoids in the rhytidome of L. gmelinii var. japonica (Table 1). Figure 3 shows a transverse section image of the tissues in the Larix gmelinii var. japonica branch with a well-developed rhytidome. In living secondary phloem of conifers, especially Pinaceae trees, mono-, sesqui-, and diterpenoids are biosynthesized in epithelial cells within internal (endogenous) secretory structures, i.e., resin cysts, ducts, canals, and cavities [21, 23, 42]. These terpenoids are transferred to and stored in the lumen of these structures as oleoresins [21, 23]. From the viewpoint of physiological function of tissue, the secondary phloem is further separated into the inner and outer part, i.e., the conducting and non-conducting phloem, respectively, in Fig. 3 [20, 21, 41, 43, 44]. The non-conducting phloem accumulates various secondary metabolites, such as phenolic and resinous substances [2, 21, 41, 43]. It was usually observed that horizontal resin ducts and parenchyma cells became conspicuously enlarged in the non-conducting phloem in many Larix, Pinus, and Picea species of Pinaceae, including L. occidentalis (Western larch) and L. laricina (American larch) [43, 44, 45, 46], due to the tangential stresses by secondary dilatation growth [21, 41]. Consequently, intracellular space volume for storage of oleoresins containing terpenoids may be larger in the non-conducting phloem than in the conducting phloem, in the larch species including L. gmelinii var. japonica. Rhytidome is composed of dead and dying layers (Fig. 3). The layers are formed by the successive development of the periderm and its separation from the outer part of the living secondary phloem, i.e., the non-conducting phloem [2, 20, 21]. Then, the secondary phloem captured into the rhytidome becomes dead tissue [2, 21, 44] and would continue to store oleoresins. In this process, the constitutive diterpenoids (1–8) would be accumulated in the rhytidome of L. gmelinii var. japonica (Table 1). An optical microscopy image of a transverse section of L. gmelinii var. japonica branch is shown in Fig. 4. Some developed fusiform resin cavities filled with oleoresins were usually observed in the dead secondary phloem within the rhytidome. A previous study  also reported that fusiform resin cysts or cavities including oleoresins were normally located in the bark tissues of 7-year-old branch of L. gmelinii var. japonica. Therefore, the diterpenoid maldistribution in the rhytidome of L. gmelinii var. japonica branch (Table 1) may be partly attributable to the usual existence of such enlarged resin cavities full of oleoresins in the rhytidome (Fig. 4). Gershenzon and coworkers [47, 48] suggested that in the natural world, high concentrations of defensive substances on the outer parts of plant bodies, such as terpenoids in glandular trichomes, could present a very effective barrier against herbivores. Similarly, the maldistribution of constitutive diterpenoids in the outermost tree tissue (rhytidome) could also be a highly effective defense against natural enemies for preventing significant damage. Terpenoids are potentially toxic to living plant tissues; hence, terpenoid storage might serve to limit the risk of toxicity to the plant itself . In addition, some types of terpenoids, especially resin acids with non-aromatic conjugated dienes, are easily oxidized by air and/or sunlight . Thus, diterpenoid accumulation in the rhytidome, which is dead tree tissue shelled with a non-permeable suberized cork layer, would be prevented from harming other living tissues in the tree’s own body and also be protected from chemical deterioration. The major constitutive diterpenoids in the branch bark tissue of L. gmelinii var. japonica were isolated and identified as 13-epimanool (1), larixol (2), larixyl acetate (3), 13-epitorulosyl acetate (4), abietic acid (5), neoabietic acid (6), dehydroabietic acid (7), and isopimaric acid (8). These diterpenoids were present in both bark tissues, the rhytidome and secondary phloem. However, the concentrations of these individual diterpenoids were higher in the rhytidome than in the secondary phloem. Enlarged resin cavities filled with oleoresins were usually found in dead secondary phloem embedded in the rhytidome. The accumulation and distribution of these diterpenoids in the bark tissues are probably caused by terpenoid biosynthesis in the living secondary phloem and the process of rhytidome formation. In terms of constitutive chemical defense of conifers, our findings show that the rhytidome provides safe and stable storage of the potentially self-toxic diterpenoids at high concentrations that may provide an effective defense against natural enemies. It is a pleasure to acknowledge the advice and help of Mr. Tsugio Oshima of Hokkaido Forest Tree Breeding Association for sampling the specimens. The authors are highly grateful to Mr. Shin-ichi Sukeno of the Forestry Research Institute, Research and Development Division, Oji Paper Co., Ltd. and Dr. Hitoshi Takagi of Japan Pulp and Paper Research Institute, Inc. for their gifts of some authentic substances. We also greatly thank Dr. Katsuyuki Tsuda and Dr. Satoshi Umeda of Asahikawa National College of Technology for their support of the NMR measurements. This work was partly supported by Grants-in-Aid for Scientific Research (No. 20580166) from the Japan Society for the Promotion of Science.